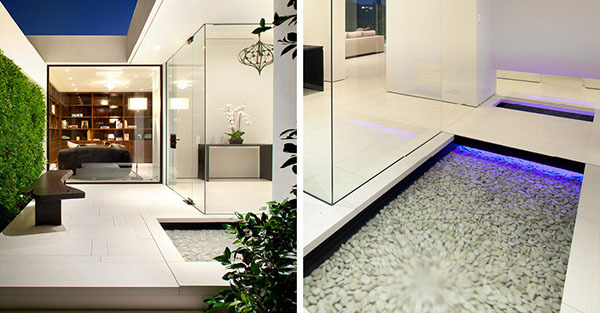 This existing home was re-conceived and renovated to create a spa-like retreat for an international fashion designer. A limited material palette and simplified detailing allows for a sophisticated, minimal aesthetic. 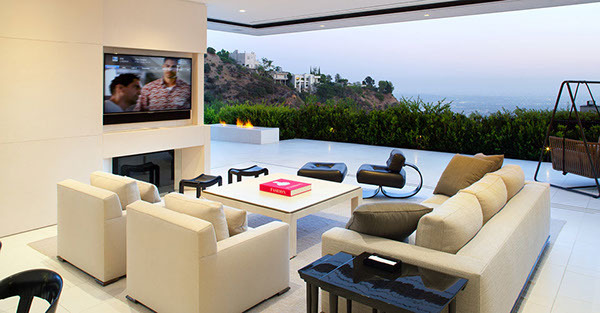 The home’s textured stucco exterior was re-plastered with a smooth white finish. Hedges and trees were planted around the home, wrapping it up in a cloak of green. After entering the front gate, a reflecting pool filled with white stones welcomes you. Specifically located for optimal feng shui, the fountain continues into the house so that its gentle noise can be heard from within. Smooth white limestone floors, set in a running bond pattern, cover all the interior floors, and stretches to the exterior terrace, ending at the edge of the lap pool. In the living room, sliding and recessed panels activate for privacy and security, and can reveal or conceal media equipment when needed. 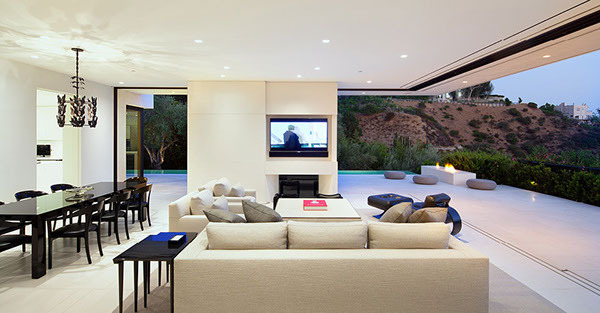 Forty feet of sliding glass doors open the house up to dazzling views of the Los Angeles basin and Pacific Ocean, allowing for seamless entertainment and relaxed living. 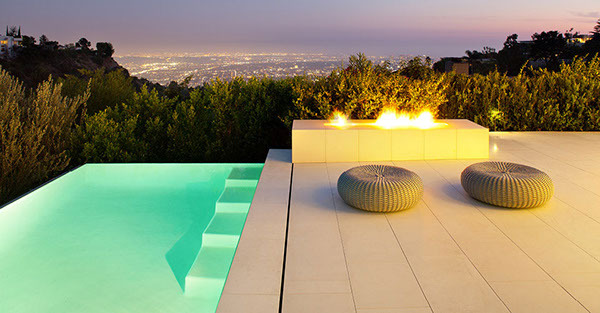 A seventy foot long lap pool with an infinity edge provides a dramatic back drop to the living spaces and ends with a fire table that draws occupants to the spectacular view. The landscape design was conceived as a planted bento box. 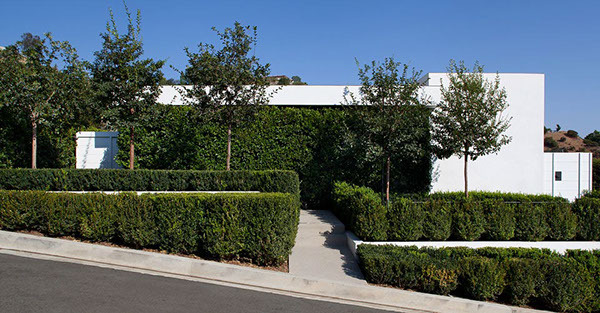 Grasses, hedges, a row of Chinese Flame trees, and gravel are laid in bands across the front yard creating layers of privacy as the house is entered. 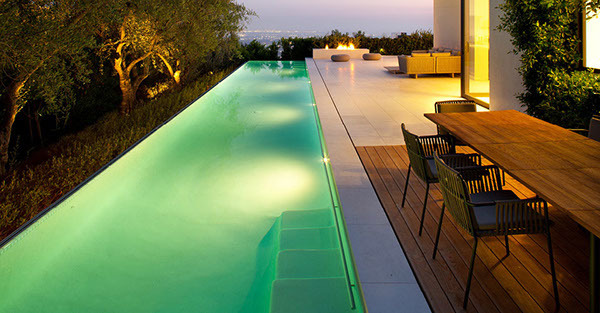 Olive trees, grown off-site for sixty years, reflect on to the pool surface forming a green backdrop to the site. Hedges trim the edges of the stone terrace and provide transition to the hillside above.